The Thomas Fire is now the fourth-largest blaze in California's modern history. A firefighter died Thursday in southern California while battling the massive Thomas Fire. Newsy's partners at KGTV say Cal Fire engineer Cory Iverson was reportedly near a "very active area" of the blaze when he died. Iverson leaves behind a wife and 2-year-old daughter. His wife is expecting another child in the spring. The fire could continue growing as high winds are expected throughout the weekend. 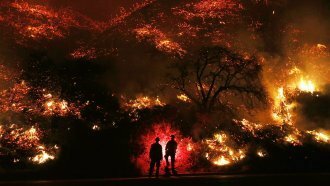 As it stands, the Thomas Fire is now the fourth largest blaze in modern state history. As of Thursday evening, firefighters had just 35 percent of the blaze contained. Nearly 1,000 homes and businesses have been damaged or destroyed and more than 94,000 people have been affected. A Cal Fire incident report released Thursday said officials hope to have the Thomas Fire completely contained by Jan. 7.